Most New Yorkers don't often venture as far North as Harlem. Unless you are a Columbia University student, or live in the Upper West Side, it can definitely be a hike to get up there - especially if you don't have a place worth traveling to. Fear not, though - these bars are, without a doubt, worth the trip uptown and will give you a taste of what Harlem cocktail culture is all about. Clay is a special place, and I don't take that lightly. The team at Clay has deep ties to the Harlem community and an unyielding passion for the business of food & drink, which is brought to the forefront by their execution of cocktails, food, and hospitable service. Bar Director, Andrea Needell Matteliano, embraces a "farm-to-bottle", seasonal approach to her cocktail menu, which compliments the farm-to-table fare, and features a similar focus on thoughtful sourcing and natural ingredients. She is an advocate for local ingredients, and spirits, which makes for a unique collection of craft spirits, liqueurs, and amari that you will not find at your everyday cocktail bar. This approach means that there are no spirits, or liqueurs, with artificial coloring on her menu, and that all coloring comes from natural ingredients. Yes, that means not even the popular aperitif, Campari, which is found in the cult-classic cocktail, the Negroni, isn't stocked behind the bar. If you are an avid supporter of all-things "local", clean, and fresh - Clay will deliver on all of those. In addition to their fabulous, vibrant cocktails - they also have an expansive, and impressive, wine list curated by Wine Director, Gabriela Davogustto, who is also responsible for the curation of Vinateria's award-winning wine list. Need I say more? You know how NYC does this amazing thing where certain bars can take you into an entirely different time or place? The Honeywell is absolutely one of those places. The ’70s decor and groovy vibe immerses you into a feel-good atmosphere that just makes you want to have the time of your life. Head Bartender, Marcio, mixes behind the bar with finesse, swag, and showmanship to make your experience both entertaining and hospitable – watching him go to work is truly a sight to be had. Their cocktail menu is balanced with both well-made classics and experimental/innovative cocktails – like cocktails in a bong; yes, that happened. There is a drink for every imbiber. If you are an adventurous spirit, make sure you keep an eye out for their famous Drag Brunch. For a flat fee, you get some priceless entertainment, and some booze & bites – definitely a good idea for a group outing. From what I’ve seen and heard, it is definitely the definition of “lit”. This spot in Hamilton Heights is a straight shot up the west side off the 1 train and is a great way to get a taste of Harlem’s always-improving cocktail culture. Right between Fredrick Douglas Blvd and St. Nicholas, this spot is an absolute gem. This intimate bar/restaurant truly embodies the essence of Harlem. From the hospitable staff to the comforting, well-executed food and drink – they truly shine. Their cocktail list is arranged to mimic the periodic table (+2 points for creativity) and the cocktails typically include no more than 5-6 ingredients which makes the list less overwhelming for new imbibers. This being said, these cocktails are well thought out and executed excellently. It is genuinely difficult to decide which cocktail to order because they are all so unique with interesting flavor profiles. The real showstopper, and cocktail list mainstay, is the Evolution. Everybody loves a flaming-thrown cocktail (a technique where ingredients are passed from one shaker or mixing vessel to another – in this case, the mix is on fire). Why is it named the Evolution? Because the cocktail’s flavors literally evolves when the drink is lit on fire and thrown (and aerated) from vessel to vessel. The heat causes the sugars to caramelize which makes the some of the sweeter ingredients more subtle and blend well with the split whiskey base forming one, cohesive, balanced cocktail. Don’t miss the (fire emoji) photo opportunity here. 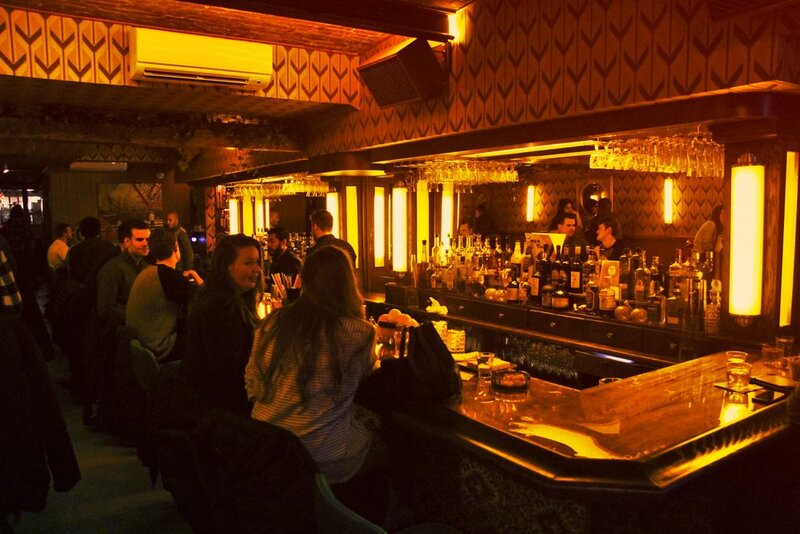 You could easily walk right past 67 Orange St. as it is a true Harlem speakeasy. The purple velvet curtains that hang in the large windows separate the sidewalk from the inside in a way that comes off as “only if you know, you know”. Reminiscent of a speakeasy you may have found during the great Harlem Renaissance – the time considered to be the golden age of African American culture, 67 Orange St. is a modern representation of a Prohibition-era speakeasy. The bartenders are dapper and well adept at making cocktails – balancing clean technique with a bit of flair to keep their patrons entertained. Their cocktail menu stays close to classic variations with some contemporary tipples as well. It features a list of drinks broken out by base spirit, as well as some “other good stuff” and impressive punches that are great for small groups of 4-6 people and will definitely leave you with a bit of a buzz. If you’re hungry don’t fret – they have some tasty bites to enjoy as well like the fried chicken sliders. Photos courtesy of The Honeywell, B2 Harlem, & 67 Orange Street.